This family brings Seasons to a new level of drama. Hello, Simmers! We’re thrilled to finally announce The Sims™ 4 Seasons Expansion Pack. * Not only is it a fan favorite and the second-most requested behind The Sims 4 Cats & Dogs,* but it’s a favorite for many of us on the team. The Sims 2 Seasons was the third pack I made in my career and it has always been near and dear to my heart. 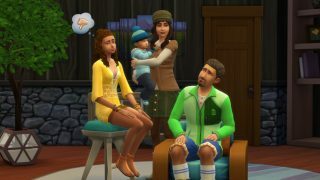 A pack as amazing as The Sims 4 Seasons needs some outside-the-box thinking. It’s a foundational pack that helps players tell stories as the weather, holidays, and seasons affect the daily lives of Sims. Speaking of stories, in the weeks ahead, we’re going to introduce you to the Climate family and share a year in their lives. Curious about that name? Rumor has it that Climate is a very traditional name from San Myshuno. The more you know! The Climates are your typical family. Janine Climate a.k.a. Mom loves being bundled up, which is why the arrival of Fall and cooler weather is her favorite part of the year – and where we’ll start our story. Go, Mom! Arthur Climate a.k.a. Dad loves the cooler weather and the rain, so we’ll be kicking off his story in the Spring. As the snow recedes, so do the homebound activities set upon us by coldness. A new day, a new way to enjoy the outdoors! Summer Climate loves... Any wild guesses? If you said summer, then my friend, you are correct. With fiery red hair to match the burning sun, will her rebelliousness get the best of her, or will she lay by the pool all season? Stay tuned! And finally, winter. We can’t say much about winter, except that it may bring some unexpected family members. This is a spoiler-free introduction, so we’ll leave it at that. We’re going to show you a year in the life of this family with lots of goodies from the pack, but it won’t stop at The Sims 4 Seasons. You’ll meet more characters, features, and elements from the full The Sims 4 catalog. We want to show you how much Seasons enhances The Sims 4 and why we think it’s one of the best experiences we’ve ever made. We hope you join us for a year of the Climates, and we’d love to see you make it your own! The characters will be available in the Gallery and will require The Sims 4 Seasons to play. From there, as always, the story will be yours. Will you change the storyline, throw in some plot twists, or change the Climates entirely? The Sims 4 Seasons will be released worldwide on June 22, 2018 for PC and Mac. Are you excited for Seasons? Let us know on the Forums and follow us on Twitter and Instagram, like us on Facebook, and subscribe to our YouTube channel.